I make this! It is yummy! Oh, I was just complaining that I need to get my curves back. Don't think that this is going to help! It looks delicious!!! hey thanks for this jennyyyyy..
Martha is such a smart chick. Oh, yum. One of my favorite desserts! I would have never thought to put ricotta in there! But damn this looks good! You are TRYING to make me fat, aren't you! I am a total sucker for cheesecake. I think I put on 5 pounds just by looking at the photo. Thanks a lot! I've never attempted homemade cheesecake. It sounds easy, but I've been known to muck up pretty simple recipes. hmmmmm.....I love strawberry coulis with mine! ohh that looks delicious!!! I'm getting so hungry! I've only had ricotta cheesecake once. It was in NYC at the little Italian restaurant in our old hotel. It didn't say it was ricotta and I took a bite, and couldn't finish it. It had the texture of cottage cheese! Seeing how skinny you are, there's NO WAY you actually eat all of this stuff!!!! KP: Yes...you have to put the ricotta in the food processor first..or yes..you get that grainy feel. Delightful! I love cheesecake... ricotta sounds so yummy! I can't wait to try this recipe. Yummy. This sounds great. I am always on the look out for new recipes to bring to our weekly swim/lunch with girls--sounds so posh doesn't it? I loved your story 'Red Means Stop' too. So cool under pressure, I tend to get flustered in situations like that, but I might take a page from your book next time. Thanks for sharing and for coming by today, I will be following you, awaiting your next post with anticipation! That? sounds awesome! And I have never heard that recipe before! Awesome! Now i have a new good recipe to use at the next work get together! You're killing me with that cheescake. i just unbuttoned my jeans, but that's not good enough, I'm wait... ...... ok, they're off now. That recipe does look easy. Ooooooo cheesecake is my weakness! I'll have to try this with the ricotta. That looks like a professional cheesecake. Yum. I am so craving this now...wish I had all the ingredients right now! My grandmother makes this and it's delicious. Although it weighs a ton which scares me a little. I mean if it weighs that much before you eat it, imagine the impact it's going to have on your a$$. Is it less calories from using ricotta cheese instead? I'm a sucker for cheesecake. I can smell it and it's slathered all over me in the form of pounds. Mmmm....I make a pineapple-ricotta pie, ala Carmella Soprano that is really good, so I know how well ricotta can work in something like this! You had ME at "Ri..."
I grew up in NY state...home of NY cheesecake..yummmmmmmmmm! I found you through my new and fab blogger buddy, Midtown Girl. Ricotta cheesecake - like Veneiro's?! Yum! I'm going to have to see if I can smuggle my baking supplies to London and experiment in my pathetic little convection oven. I love anything made with Ricotta, thanks for the recipe. ricotta cheese is often overlooked and underrated. You have found the perfect use :-) looks heavenly. Yum! Must try. I love to eat Ricotta cheese with mini chocolate chips mixed in or lemon flavoring or rum flavoring....This should be an awesome cake! 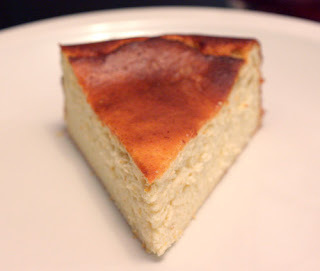 I make a similar cheesecake with both ricotta and cream cheese. It is just fabulous. OMG! this looks SOOO YUMMY! You had me at cheesecake! This looks fabulous! Thanks for the recipe. I make un uncooked cheesecake variant (European, with cream cheese, cream and gelatine) which I am sure could do with some ricotta substitution. I will let you know how it goes next time I make it! I've made this so many times! The thing I do differently is that I use a phyllo crust. Just my way of putting a Greek spin on it! Mmm, love a nice cheesecake, and some are a bit on the gluggy, heavy side. Will have to try this one. i hate hate hate cheese cake with a passion... i love love love ricotta cheese cake! Having had to make 14 cheesecakes for a wedding in September I never wanted to see another one. But this I might try. Ahhh man how you kill me with these amazing recipes! ooh, my daughter and I are going to have to try this one. Looks delicious! I do enjoy Ricotta cheesecake. I make it for my Dad since he loves it. If I could I would eat a slice of cheesecake every single day. Yummy.